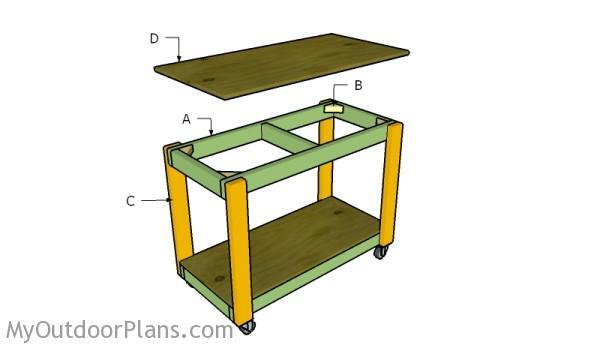 This step by step diy woodworking project is about portable workbench plans. This article features detailed instructions for building a super basic 24″x48″ workbench on caster wheels. 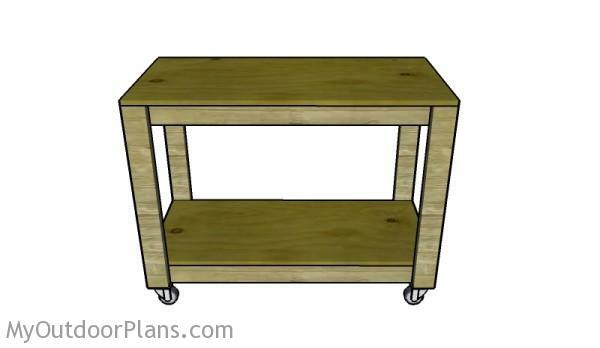 If you need a workbench that can be moved easily, this project is the right one for you. Make sure you adjust the size of the assemble to suit your needs. Take a look over the rest of our woodworking plans, if you want to get more building inspiration. The first step of the project is to build the frames for the workbench. Cut the components from 2×4 lumber. Drill pilot holes through the 48″ long beams and insert 2 1/2″ screws into the perpendicular components. Make sure the edges are flush and the corners are square. Fit braces to the four corners of the frame to enhance the rigidity of the frames. 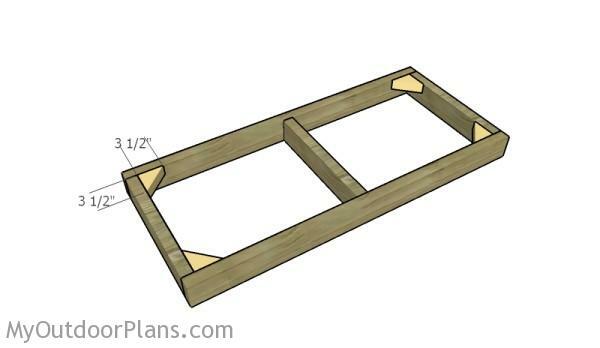 Cut pieces of 2×4 at 3 1/2″ lumber and cut them on diagonal. Fit the braces to the corners and lock them into place with screws. 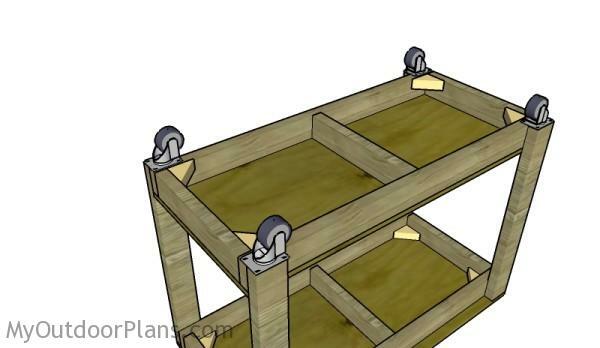 After building the top and bottom frames, you need to assemble the workbench together by attaching the legs. Use a carpentry square to make sure the corners are right-angled. Drill pilot holes through the legs and insert 2 1/2″ screws into the frames. 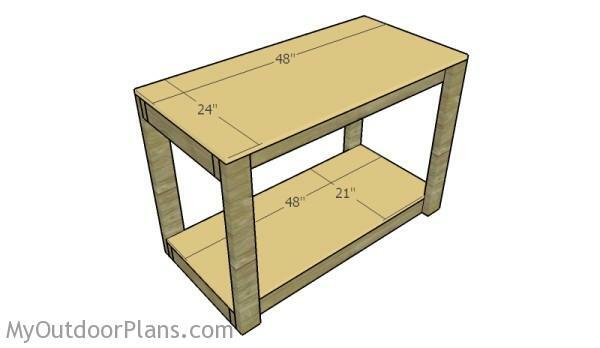 Cut the bottom shelf and the tabletop from 3/4″ plywood. 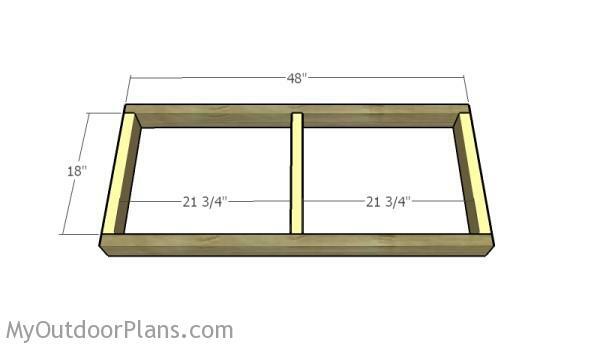 Fit the panels to the frame of the workbench and lock them into place with 1 1/4″ brad nails or screws. Align the edges with attention for a professional result. One of the last steps of the project is to attach the caster wheels to the bottom of the workbench. The 3″ caster wheels are ideal for this project. 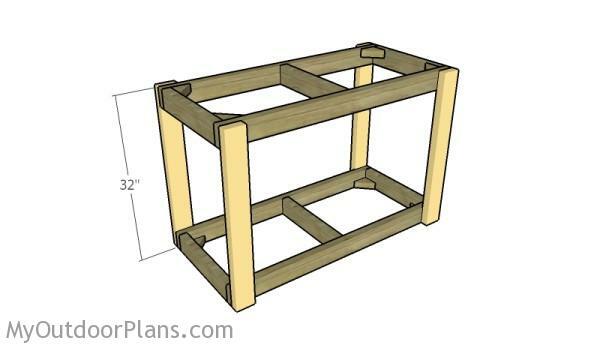 Fit them to the frame and lock them into place with 1 1/4″ screws. You can attach hooks to the frame of the workbench. In this manner, you can hang tools to the workbench and use the space efficiently. 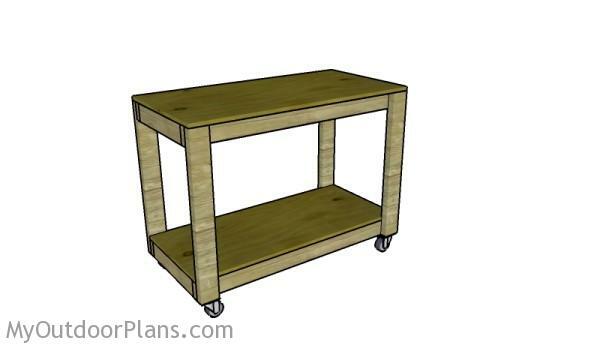 This woodworking project was about portable workbench plans free. If you want to see more outdoor plans, check out the rest of our step by step projects and follow the instructions to obtain a professional result.